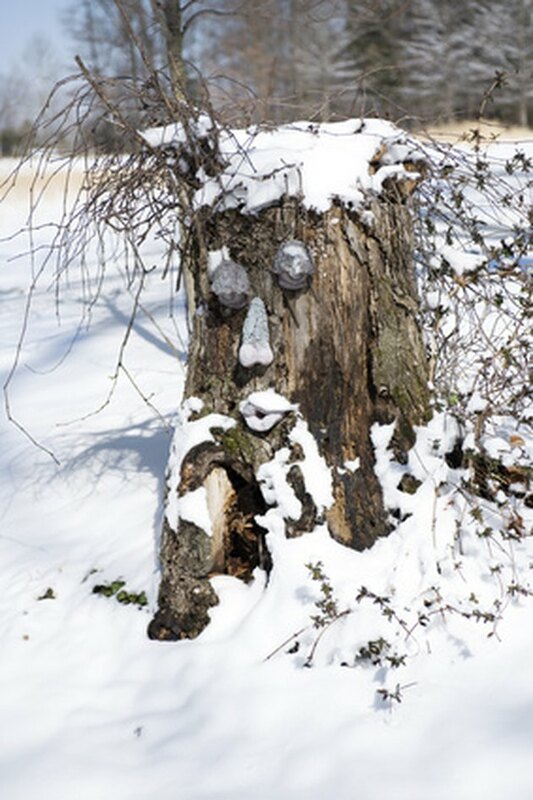 Tree faces are decorations that are part folk art and part garden ornament. The parts of these faces, which consist of eyes, nose and a mouth, each attach to the tree independently of one another. You can mold the faces by hand to your own tastes using concrete or a more lightweight hypertufa mixture. Tree faces may look sophisticated or crude, depending on your tastes. The distinctive look of the tree face adds to the charm of the decoration. A tree facecan be molded from concrete. Sketch out the eyes, nose and mouth of the tree face that you wish to sculpt. By designing the tree face before you create it, you will have your design in mind during the sculpting process. Combine a dry mixture of one part cement, one part peat moss and one part vermiculite. Combine concrete dye and water in a measuring cup. Use just enough brown and black dye to make the cement mixture's colors similar to those of tree bark. Mix the wet ingredients and dry ingredients by hand in a plastic bucket. Use rubber gloves to keep the caustic mixture off your hands. Spread out a plastic bag. Place a lump of the mixture onto the bag and hand-shape it to form an eye. Press a glass marble into the center of the eye to form the eye pupil. Add pine cone needles along the edge of the eyelid to form eye lashes. Press bark into the eyelid to transfer the bark texture onto the eyelid. Turn over the eye and press a metal loop into the back of the eye to create a place from which you can hang the eye on the tree. Repeat the process to form a second eye. Sculpt a nose and mouth with your hands, using the same process that you used to form the eye. Press bark into the bridge of the nose to create texture. If you wish, form a mustache under the nose. Press pine cone bristles into the mustache to give it texture. Form large lips for a girl's mouth. Add features such as buck teeth or a woman's necklace made of decorative stone. Put metal loops in the back of each piece that you sculpt. Mist the pieces of the face with a misting bottle and cover with plastic to allow them to harden and cure. Although the concrete will seem hard after 12 to 24 hours, this is a brittle state. Concrete can take up to seven days to become hard to the point that it is not brittle. This process is known as curing. Uncover the pieces every few days and mist again. When the pieces have cured, hang them on a tree.